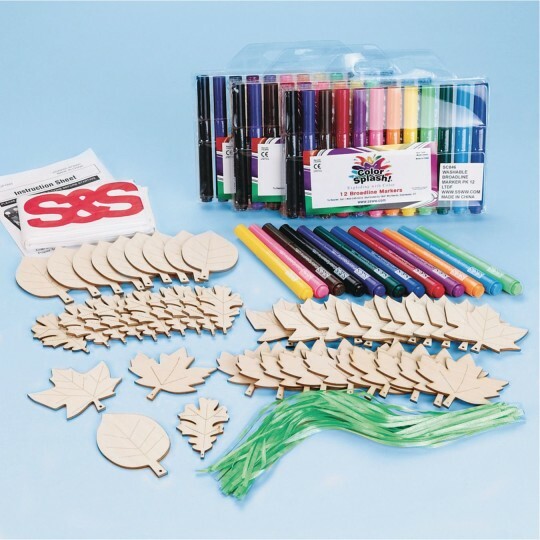 Make "earthy" ornaments or harvest time decorations with 12 each of 4 wood leaf shapes, ribbon, markers and an EduCraft® guide. Simply color the leaves any way you'd like. A big group project for all ages. Leaves measure between 3-4" depending on the design. All are 3mm thick. just used these at a family weekend camp event ages 3 to 9 and their parents. I put out markers crayons different lanyard colors twine yarn pipe cleaners wooden beads and pony beads and the wooden leaves. 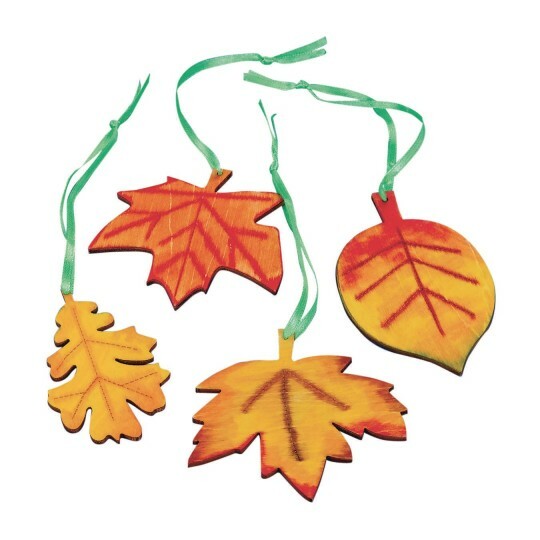 Directions at the craft station were simple: Decorate a leaf or two and make a necklace or hanging ornament. I made 3 different samples to show the many possibilities and the families had a great time. The younger ones put beads on pipe cleaners and made bracelets one mom even used 5 leaves and made a mobile with a couple sticks and the beads. super versatile and not cheap looking even though they are a good price. Only negative was one parent tried to make a key ring and the wooden hole area did not stand up to the entire weekend in a pocket! I loved this for a fall craft. The residents at our assisted living facility enjoyed themselves immensely and were able to let their creative juices flow. They have used to decorate door handles walkers and wheelchairs. Great activity for a quick quiet time for festival attendees. The children loved making these! I used it for our fall family fun day and it was a big hit. The children were proud of the ornaments that they made and wanted to make more than one. they could be as creative as they wanted without help. Smaller than I thought...but cute! Used as awards for nature campers- painted by instructor. Much smaller than we thought but still a fair quality.